When he moaned and sobbed, it was with the pain of living that was of old the pain of his wild fathers, and the fear and mystery of the cold and dark that was to them fear and mystery. And that he should be stirred by it marked the completeness with which he harked back through the ages of fire and roof to the raw beginnings of life in the howling ages. 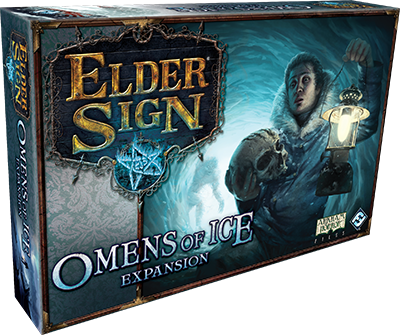 Fantasy Flight Games is proud to announce Omens of Ice, an upcoming expansion for the cooperative dice game, Elder Sign. Twenty years ago, during the Klondike Gold Rush, over a hundred thousand prospectors traveled deep into the Alaskan territory. Most of them perished in the ice, a few got rich, and some awoke terrible, ancient evils. Now, down in usually temperate Arkham, the winds are blowing harder and colder than ever before. The Miskatonic has frozen over. Some people complain of insatiable hunger and sometimes the newspapers even report cannibalism. You know all too well that the Ancient Ones are causing the weather and hunger, but this time you cannot fight them from within the Arkham Museum, or even out on Arkham’s streets. You must brave the brutal conditions that killed thousands of prospectors, and fight ferocious creatures from this world and others, or else the cold, hunger, and ice will devastate humanity. 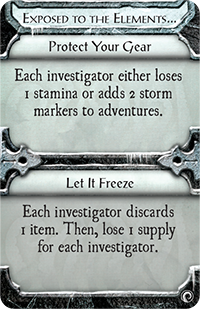 Omens of Ice takes you and your fellow investigators on a treacherous journey into the Alaskan wildernesses, where you must solve the mysteries of three terrible new Ancient Ones. Whether you choose to travel in summer or are forced to go in winter’s dark, at every step you’ll face terrible perils, from the port of Anchorage to the forest paths and mountain passes of the interior. You must constantly fight not only wild animals and ravenous monsters, but frostbite, starvation, and the madness that befalls many who enter this frozen, isolated, white world. 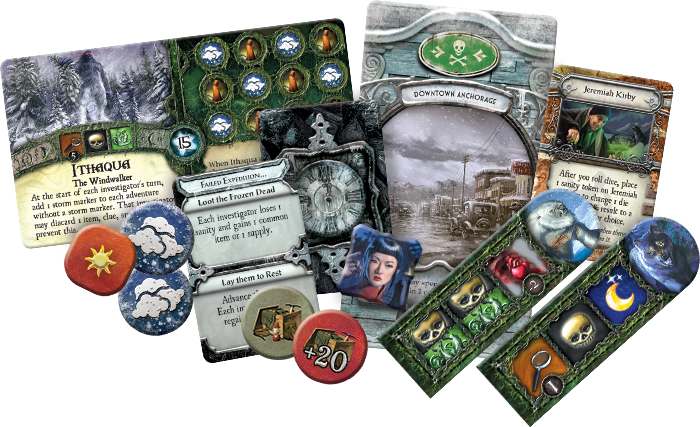 This expansion introduces the Alaska Expedition game mode, in which the deck of Alaska Adventures replaces the Adventure deck found in the Elder Sign Core Set. These new Adventures bring to life the creatures, climate, ancient magics, and native peoples of the far northwest. The deck also shapes your journey into two stages. 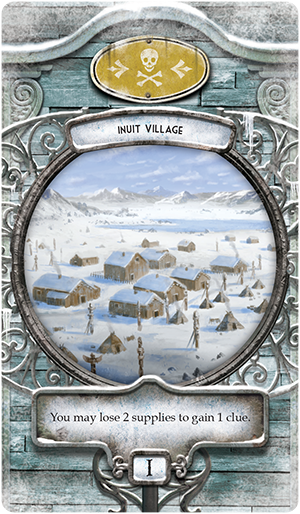 During the first stage, you’ll explore the more hospitable locations of the Alaskan territory, such as Anchorage, Fairbanks, and an Inuit village. In the second stage, you enter the true wilderness of the Arctic, where lie the lairs of beasts, snowy expanses of taiga, and mines abandoned after the Klondike Rush. 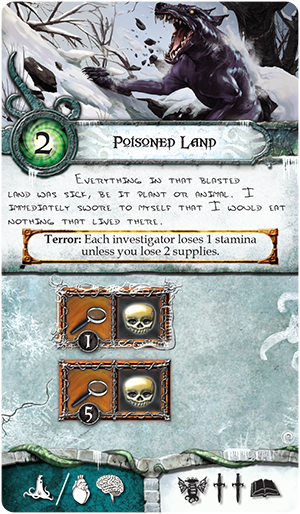 As in the Streets of Arkham game mode, an investigator must enter a location before anyone may learn what awaits there. In general, however, the deeper into Alaska you go, the more challenging your adventures will be. Click on the locations to reveal the adventures. This far north the difference between seasons is dramatic, marked by the severity of the storms, the extent of the ice and snow, and the amount of daylight. Omens of Ice enables you to choose whether to undertake your journey in the summer’s comparative calm, when light and comfort are more abundant, or in the stormy depths of winter, when food, light, and warmth are scarce. A winter journey is far more difficult, and you can only spend a limited number of days in the wilderness before it defeats you. No matter what time of year you travel, your team will need supplies: food, firestarters, bandages, warm clothes, and more. In the Alaska Expedition game mode, you begin with fifteen boxes of supplies which you will consume—or lose—in the course of your adventures. You might acquire more supplies in the first stage of your journey, but it is very unlikely you’ll find any out in the wild. When the supplies are gone, all the investigators in your party will quickly lose stamina as they succumb to hunger, cold, and exhaustion. The sooner you can acquire the Elder Signs you need to defeat the Ancient Ones, the more likely your team will make it back to civilization alive. The diabolical forces of nature are at work in all seasons. No matter when you make your journey, you’ll encounter storms—fewer of them in summer, certainly, but this far north with an Ancient One stirring, a blizzard may occur at any time of year. Various game effects, including failure penalties and the doom track, force you to place storm markers on the Adventures in play. Some storms are mild and barely affect your expedition. Others can drain your stamina or sanity, ruin your supplies, or spawn a monster. Unfortunately, you won’t know what a storm is like until you’re in the midst of it, resolving the adventure that awaits. 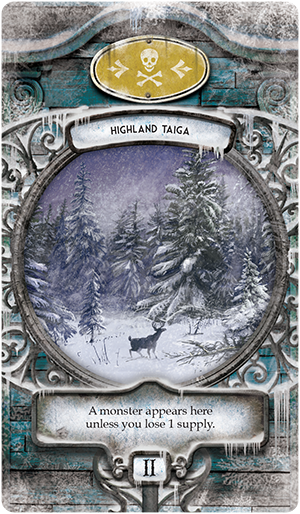 Natural phenomena permeate the Alaskan Mythos deck as well. Certainly you’ll encounter blizzards and other severe weather. You may have to cross a frozen river and risk falling through the ice. You may find that your camp is swallowed by piling snows or surrounded by howling beasts. Being Exposed to the Elements could drain your stamina as you struggle to protect your gea—once your supplies freeze through, they become useless. The Aurora Borealis isn’t just a brilliant nighttime show. These Strange Lights signify an opening to an Other World, which may spawn monsters across Alaska, or bring doom nearer. Alaska has always been home to dangerous animals, their fierceness amplified by hunger and cold. Tales of Yetis and Gnoph-Keh predate the arrival of the first Europeans in the region. Now, as the weather worsens for unnatural reasons, these monsters proliferate. Grizzly bears, normally aloof, now fearlessly attack humans. Wolves will relentlessly plague you and your sled dogs, tied to the nighttime through some dark power. At midnight, an undefeated wolf pack causes another monster to appear—very likely another pack of ravenous, hungry wolves. Only the most determined investigators, those willing to endure the worst horrors and even sacrifice their lives, will volunteer to go north. Explorers, travelers, and criminals all have the endurance and grit necessary for an Alaskan journey. 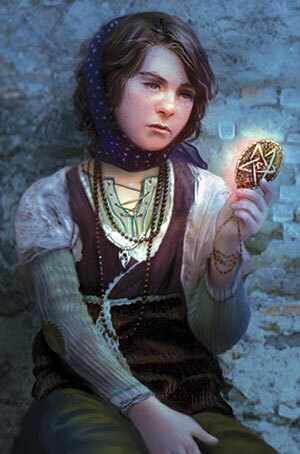 Yet among the fearless souls who join the investigators in Omens of Ice is a lonely, parentless child. Wendy Adams is accustomed to surviving in hard conditions and has nothing of her own to lose. Her mother was taken away to an insane asylum shortly after her father disappeared at sea. Since then, she has lived on the streets of Arkham, seeking answers to the questions raised by her parents’ mysterious tales and dark fates. Wendy carries with her a unique item and a clue. While her family seems to have been cursed, she herself has a divine gift: the ability to change a terror result to any result of her choice by spending a sanity. This gift may prove to be the salvation of the entire team, since it may prevent the loss of stamina or supplies, and even stave off a terrible winter storm. 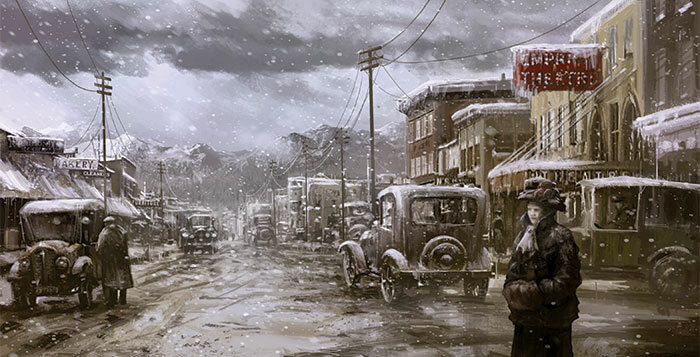 Mountains of snow lie in the streets of Arkham. Ice coats the windows of Velma’s Diner and tall icicles hang from the gambrel roof of the Silver Twilight Lodge. Miskatonic University has ceased holding class for fear that students and professors will get frostbite while crossing campus. Even when curled up by the fireplace of Ma’s Boarding House, an unnatural chill creeps in and freezes your bones. The only way to bring warmth back the world is to confront the cold, venture into the Alaskan wild, solve its prehistoric mysteries, and stop the Ancient Ones from awakening. Omens of Ice will be available before the snow melts and the ice thaws, in the first quarter of 2016. 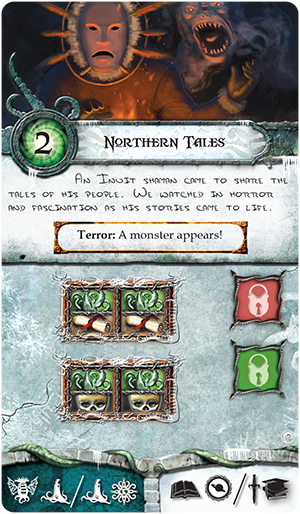 Until then, visit the Elder Sign minisite for more information. Elder Sign is a cooperative dice game of supernatural intrigue for one to eight players by Richard Launius and Kevin Wilson, the designers of Arkham Horror.